The shoemaker sees more sales and profitability gains ahead in the new fiscal year. Shoe specialist Deckers Outdoor (NYSE:DECK) trounced the market last month, gaining 21% compared to a 2% increase in the S&P 500, according to data provided by S&P Global Market Intelligence. The move higher added to a dramatic turnaround for the retailer's stock. Its shares had spent most of the past few years trailing the market only to race ahead of the S&P 500 in 2018. May's rally was sparked by solid operating news. Deckers announced 8% higher sales in its fiscal fourth quarter, which marked its fifth straight quarter of edging past management's targets on that score. This top-line success paired with improving profit margins to push the business back into overall profitability for the quarter and the 2018 fiscal year. "We are well positioned to achieve our long-term objectives," CEO Dave Powers told investors on May 25. Powers and his team are targeting annual sales of at least $2 billion by fiscal 2020 and operating margin of 13% of sales. 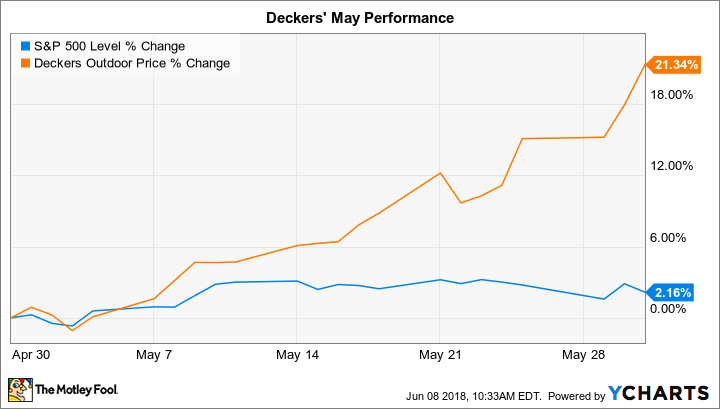 Deckers' 2019 forecast assumes solid progress toward that goal, with sales set to rise to between $1.93 billion and $1.95 billion as operating margin stops at between 12.6% and 12.8% of sales. Continued success in its core UGG franchise and the surging Hoka brand will be key in achieving both those short-term and longer-term results.